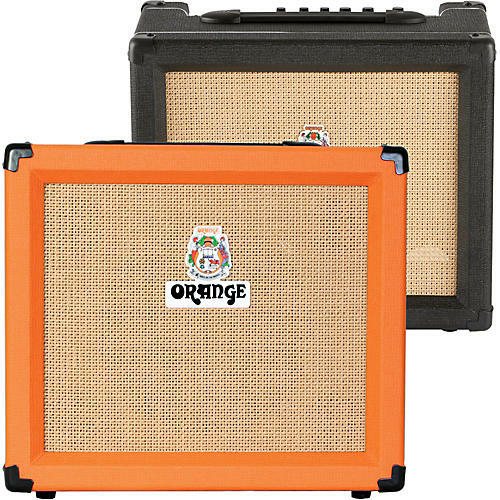 The first thing you notice about Orange Crush amplifiers is their cool looks. Just like their bigger brothers, they have the legendary Orange basket weave Tolex, woven speaker grille, beading and legendary hieroglyphs (PiX) and of course the Orange signature 'picture frame' edging. But it's not just cool looks”plug into the Orange Crush PiX CR35LDX amp, or any of these great little Orange guitar amps and you'll soon realize they are Orange through and through. The 35W Orange Crush PiX Series CR35LDX 35W 1x10 Guitar Combo Amp features 3-band EQ control to better define your sound. The switchable overdrive (with optional footswitch) kicks your guitar into high-gear with plenty of heavy tone. The Orange amp's built-in tuner is easy, helpful, and keeps you in precise tune. The auxiliary input is great for an MP3 player, for playing along to, or just jamming out with the loudspeaker. The Orange CR35LDX amp's headphone out is great for silent practicing. The collection of digital effects adds character to sound. This 35W Orange amplifier's effects include delay, reverb, chorus, and tremolo for a wide assortment of sounds you can get in this sweet combo. A line out also lets you plug in to a larger stack, or into a soundboard for an amplified experience with the tone and control of your Orange guitar amp.